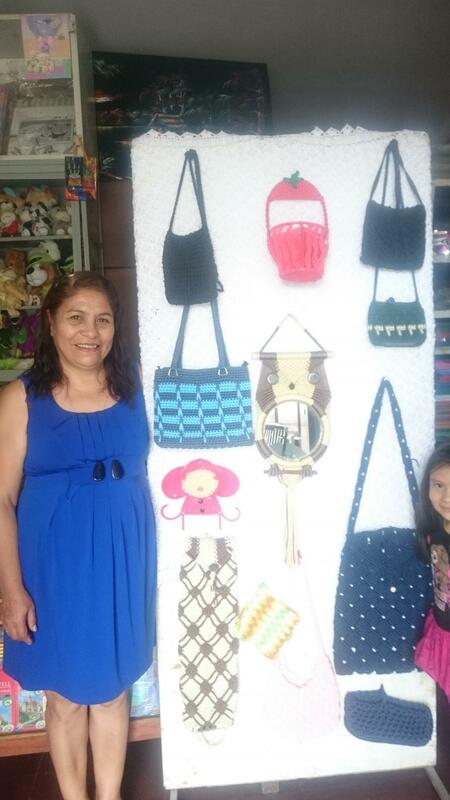 A loan of $4,000 helped to buy machinery and special equipment to make her macrame products and to generate better earnings. Edith, age 60, is an enterprising woman. She has four professional daughters, who are not dependent upon her. Edith retired from teaching over three years ago. Now she wants to establish a shop for macrame weaving. This is a dream she has had since she was very young. She has the requisite training for this type of weaving. She needs the loan to buy machinery and special equipment to make her products and to establish her own shop in this way. She currently has a bookstore. She has good prospects because getting ahead is what motivates her the most, and she has several goals to achieve. She wants to get working capital that will allow her to have greater financial stability. Edith comes from a humble and, most of all, hard-working family. She has been instilled with the values of humility, the good administration of resources, and respect. She has a vision for entrepreneurship and for reaching the objectives that she sets for herself over the course of her technical career. Translated from Spanish by Kiva volunteer Ginny Kalish. View original language description. La señora Edith es una mujer emprendedora de 60 años de edad, tiene cuatro hijas profesionales que no dependen de ella. Hace más de 3 años que la señora Edith se jubilo de profesora. Ahora quiere establecer un taller para tejidos de macramé, un sueño que tiene desde muy joven, Ella cuenta con la capacitación respectiva para realizar esta clase de tejidos. Necesita del préstamos para la compra maquinaria y equipo especial para la elaboración de sus productos, para así establecer su propio taller. Actualmente la cliente cuenta con una librería. La señora cuenta con buenas expectativas ya que a ella lo que más le motiva es salir adelante y con varias metas por realizar, quiere llegar a formar un capital de trabajo que le pueda brindar una mayor estabilidad económica. La señora Edith viene de una familia humilde y sobre todo trabajadora la cual esta inculcada con los valores de humildad, buena administración de recursos, respeto, con una visión de emprendimiento y alcanzar los objetivos que ella misma se traza a lo largo de su carrera técnica. It offers entrepreneurs loans with grace periods to set up new businesses. This loan product is designed to help entrepreneurs set up new businesses in Bolivia. To make this possible, Cidre is collaborating with organizations like the Fautapo Foundation to provide training, development of business and growth models, and identify needs for working capital to these entrepreneurs. Kiva and Cidre are working together to offer larger loans with grace periods to help these entrepreneurs successfully start up new businesses. CIDRE is a Bolivian microfinance institution with a strong social commitment to the community. It works to provide quality financial services to rural and peri-urban borrowers, focusing primarily on agricultural loans for dairy farmers and micro-enterprises. CIDRE targets segments of the population that have not traditionally had access to credit, and invests in much-needed community development projects. It is currently working with coca farmers in the Chapare region to replace coca with less controversial crops. Get more involved by joining the Friends of CIDRE lending team. Kiva partners with CIDRE because the organization occupies a unique space in the highly-developed Bolivian microfinance market. CIDRE focuses on promoting sustainable development in underserved rural areas of central Bolivia through improvements in public policy, environmental protection, and technological innovation. CIDRE’s innovative initiatives include a reforestation program that gives titles to landless peasants while also improving the environment, and an agricultural insurance fund that offers small farmers protection for losses in the event of bad weather. CIDRE also works on communal hydroelectric projects and provides borrowers in coca-growing regions with the capital and expertise necessary to develop alternative livelihoods. Interest-free Kiva loans fund CIDRE’s individual loan program, helping the organization minimize its cost of capital in order to continue charging its microfinance clients some of the lowest interest rates in the industry. By supporting CIDRE clients, Kiva lenders allow rural Bolivians to continue accessing low-interest loans to improve their businesses.